You know when you see an outfit and think I HAVE to recreate this? Well, that was my thought when I pinned this outfit. After, Mood Fabrics contacted me to be part of the Mood Sewing Network, I knew this was the outfit I wanted to make for my debut outfit. 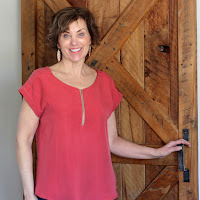 I have had red skinny jeans in my wardrobe for a year now but knew a wide leg trouser style would be a perfect addition. 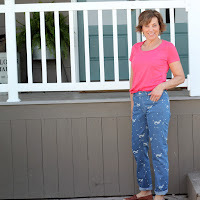 I perfected the fit on Burda 7447 pants and widened the legs from the knee down for more of a wide leg look. This Burda pattern has all the elements of a great trouser, welt pockets, front pockets, wide waistband and belt loops, it seemed like a natural choice for my red pants. 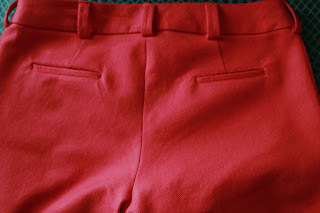 Once you get past the welt pockets on the back of the trousers, these pants go together very quickly. I selected Lipstick Red Italian Cotton Suiting for the trousers. 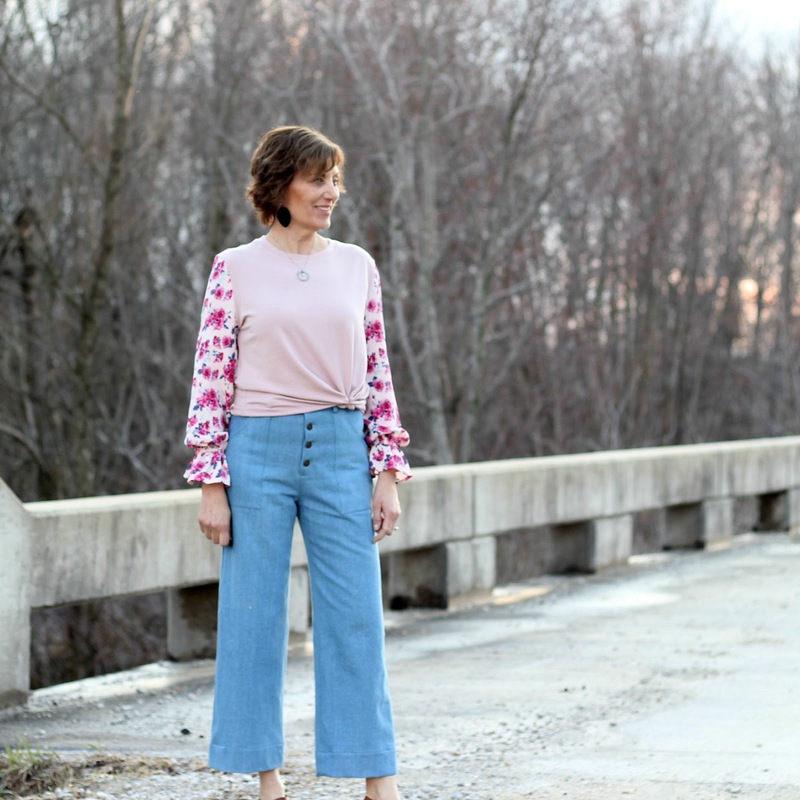 This fabric is the perfect weight and drape for the pants. 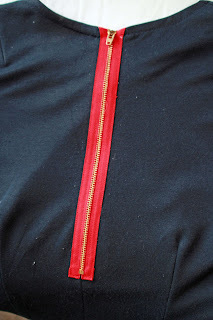 One fact that helped me with the welt pockets, was to baste the stitching lines of the welt pocket on both back pieces. This helps to keep your stitching consistent on each back piece and your welt pockets look the same! 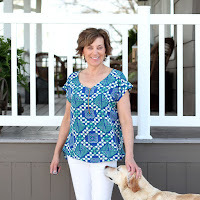 For the peplum top the natural choice was Vogue 8815, a very popular pattern in the blogosphere for the very trendy peplum top. I did add 1" to the bodice of the top, it looked very short on the pattern envelope. 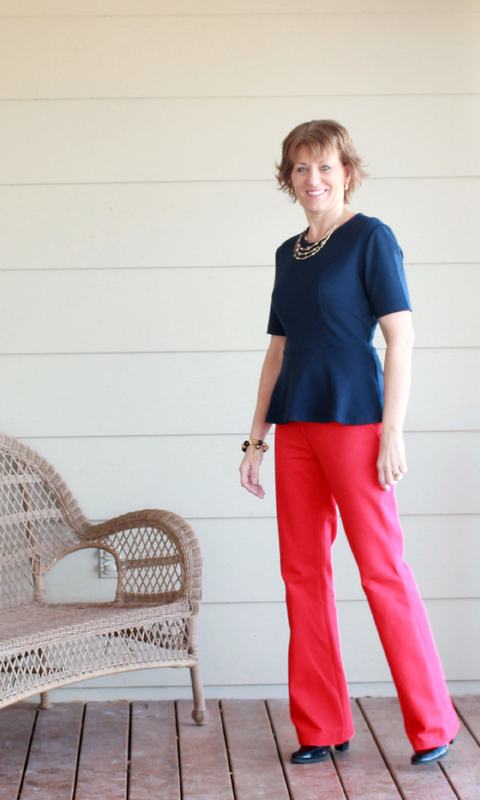 For the peplum top, I selected a ponte knit. Mood had the perfect shade in the Dark Navy Ponte to complete my inspiration picture. 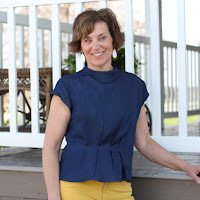 I did want to add a little something extra to the back of the peplum top and an exposed zipper seemed to be the perfect addition. You know when you have on an outfit and it just makes you feel great? Well, this outfit does that for me, in my mind I stand a little straighter, have a confidence in my stride and a smile on my face. 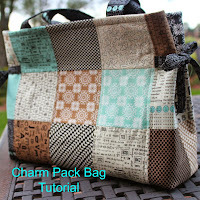 It is that perfect combination of the right fabric and pattern to achieve "the look". My garments turned out just like the picture I found on the internet and the picture I had in my head, gotta love that. These pieces look amazing together but will work independently as well. Oh, happy days! 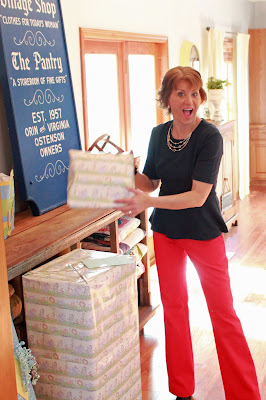 Yes, I am one excited first-time "nana"! Love the top and the pants. They're great together! Thank you so much. It is a fun outfit, so happy I found the inspiration on Pinterest. What a great outfit Lori! And the pieces will work great seperately too. Very classic looks that will span several seasons. Thank you, Lisa, I think it will work well for a while, too. Great looking outfit. Fit looks spot on. Killer debut! It looks fantastic. I love navy blue at the moment. Thanks, Karin, I feel the same way about navy, too. I have another piece of ponte a bit lighter in my stash, still deciding what to make. Love it. Stealing it. I might make it. LOL. You look fantastic. 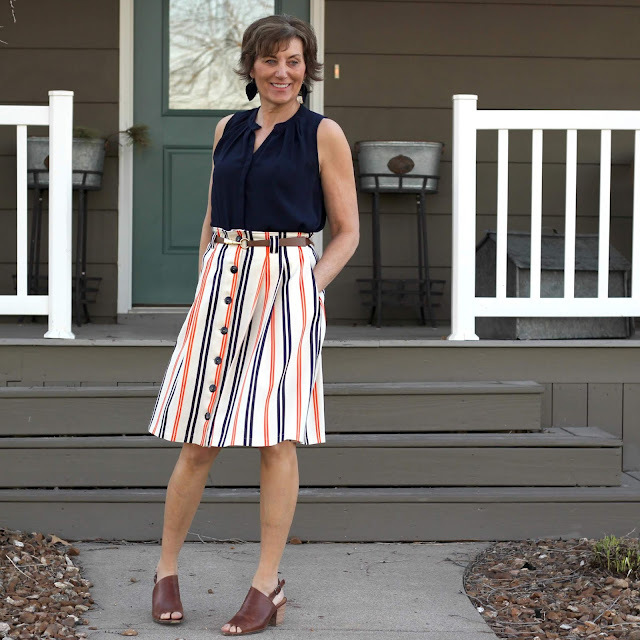 Give the Burda pattern a try, I think it fits great. Thanks so much. Thanks, Helen. The zipper really adds to the top. I appreciate your kind comment and I am thrilled to be part of the MSN. You look great Lori. Congrats for being selected for the Mood Network. Beautiful outfit. I had a very similar navy peplum top a few years ago. I should make another as I loved it SO much. Super cute outfit! 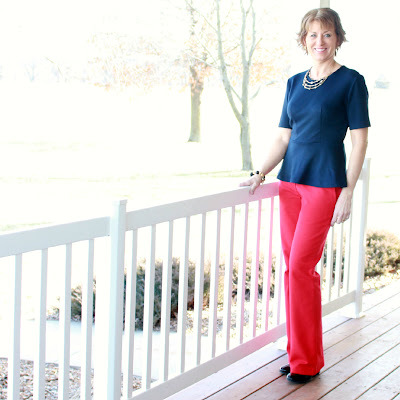 Love the exposed zip and the red/navy combo...and congrats on impending gmom-hood! Love this fresh color combination, great outfit! Very nice. Better than the inspiration! Your outfit looks awesome! I love reading your blog! I think you should make another top and have the exposed zipper in front. You have a wonderful sense of style! these look fabulous on you. You have a fantastic figure! I looove the red. Super outfit. Your slim body is such a nice hanger for those red pants. 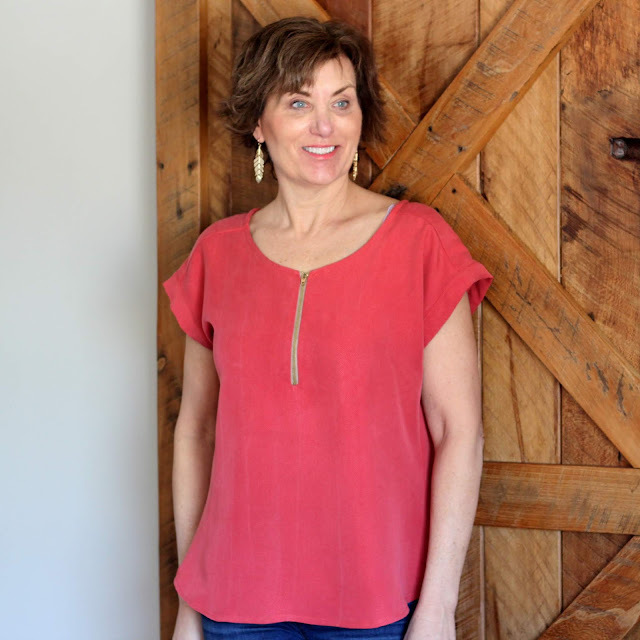 Red exposed zip in your top is a perfect detail. That's an outfit that belongs in a upscale boutique. I think yours looks even better than the inspiration photo! I absolutely LOVE the red zipper in the back! 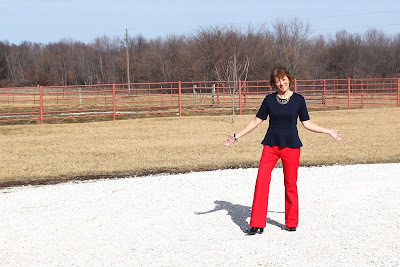 Lori I TOTALLY forgot to mention that the red pants you made back in February inspired me to make mine. I'd been wanting a pair every since I saw yours. 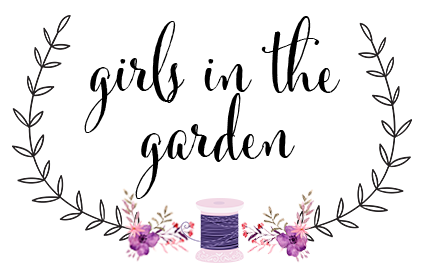 You are really a great sewing inspiration!